As I was editing these photos, I just kept singing “I’ve got big thighs and I cannot lie.” Like, this is not okay anymore. Gym starts today! I actually have an agreement with someone where we have to hold each other accountable if we don’t go so hopefully that helps. What are your favorite workouts? I need some good ideas! I’m really bad at doing things on my own so any tips/tricks help me. 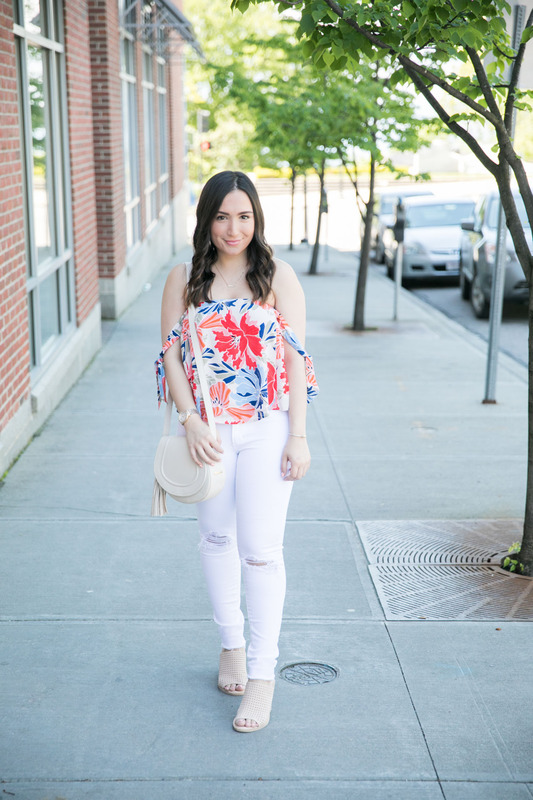 Anyways, on to the outfit… I shot this look while in Vermont and I am seriously obsessed with this top. Not only is the print so much fun, but it’s called Havana, which is where in Cuba my parents are from! It comes in two other solid colors but I wanted to spice things up and wear something brighter than my usual outfits. The natural color is gorgeous, though! 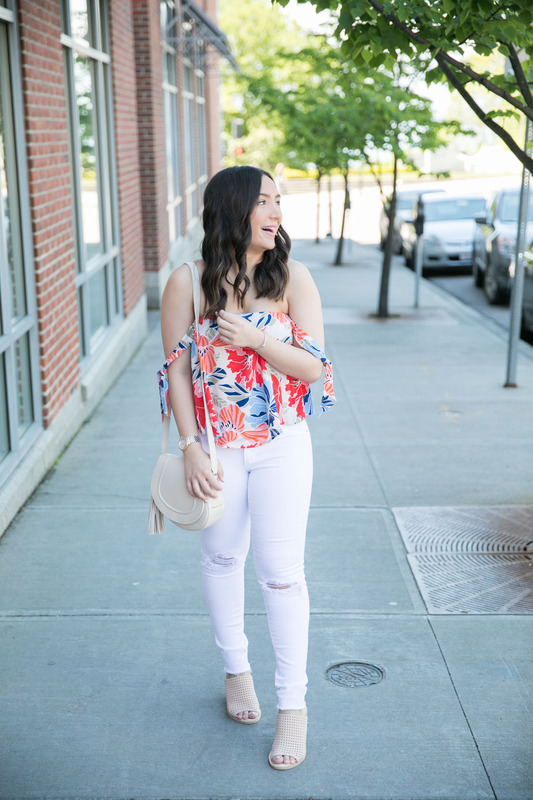 In my opinion, a printed off the shoulder top is a must-have for spring and summer. You can wear it with cutoffs, white jeans (under $60!) or even a denim skirt. I paired it with white jeans in this case but will definitely wear it with shorts later on! I also have been wearing this bag nonstop. It’s the perfect summer accessory and comes in a bunch of colors! I also love the tassel details and how spacious it is inside. I took it with me to Vermont and basically wore it every day. And I’m someone who puts a lot of stuff in my bag, so you know this is a good one. This is one of the prettiest floral prints I’ve seen. I’m really loving the color scheme here! I love the colors/ print of that tank! So perfect for summer. You look so pretty! That top is the prettiest print! 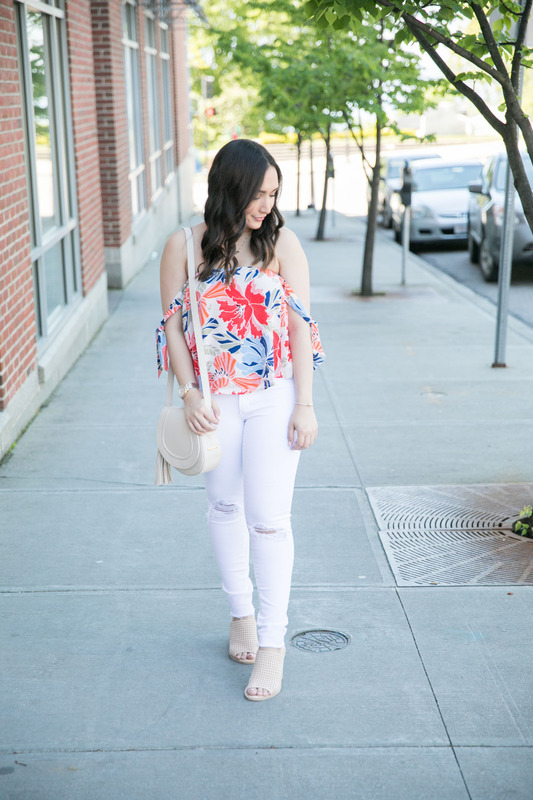 I love this top paired with white denim! Too cute! 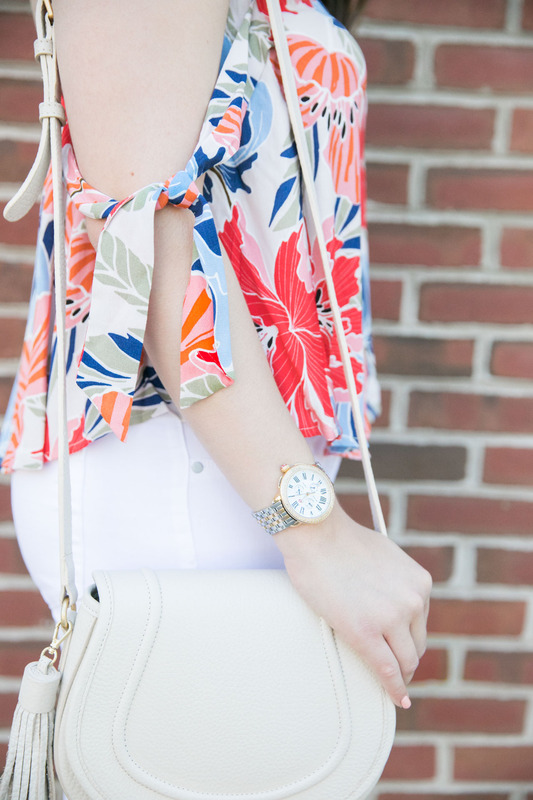 This floral top is so pretty for summer. I love that you could style it like you did or with a red skirt for the 4th of July! Cute! Looks so perfect with the white denim, I love this top! That top is so cute on you! Love the colors! Getting started can be tough, I always do things I enjoy that give you that workout. Like rock climbing, biking, etc. Good luck! Such a sweet blouse! Love how it’s a little cropped.